Have you ever wanted diapers for baby that can be both cloth and disposable depending on the situation? The Flip Hybrid Diaper System can be both and it adapts to your baby's needs. We received the system to try out and we're here to tell you all about it. While Baby T is slowly transitioning to the potty, we still use cloth diapers for nap time, bedtime, and some Eco-friendly disposables when we travel. It was great to try this hybrid system that adapts so well to whatever we need at the moment. First, I really like how simple it is and that it's easy to care for. There is no stuffing, no need to match inserts to diapers, no need to take insert out, the cover and insert dry fast. You can also further simplify by choosing hook/loop or go with snaps if you wish. Flip one-size cover with one-size stay-dry insert, turn this microfiber side down and tuck under flaps! Second, the options that are available are really versatile! The stay-dry insert is good for sensitive skin that doesn't do well with a wet diaper. Not a fan of synthetics? No problem, you can choose the organic cotton inserts. Have a heavy wetter? Choose the organic cotton night time inserts. Plane travel or road trip? You can use the easy-to-rinse covers with disposable inserts for convenience. It's nice to have these choices, I actually like all three for different purposes. Plus if you had a situation like mine with hard water ruining all the microfiber diapers, it's really easy to switch to organic cotton without having to toss the covers! At least you recover most of your investment. Last but not least, it is a budget friendly system. The Flip covers retail for $14.95 each and are usually even cheaper at competitive online retailers. The stay-dry inserts come in packs of three one-size inserts ($14.95) or six newborn inserts ($11.95), also available in a combo pack of two covers and and six one-size inserts for $49.95. You may find all the available combinations here. A three pack of organic cotton inserts is $18.95 and a combo of two covers with eight inserts is $59.95. The night time two-pack of organic inserts is $22.95. A package of eighteen disposable inserts is $5.95. 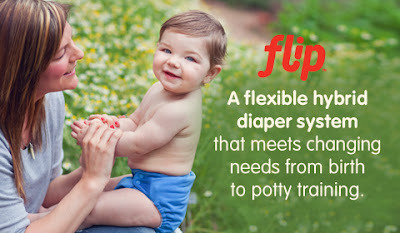 The Flip Hybrid Diaper System is a great choice for those that like options and want to cloth diaper on a budget! I have two flip covers but I've never tried the inserts. I like them. They've held up over these last 11 months just fine. I'm curious to try the inserts to see how I like them. I usually use them with Flats. I've also tried them with prefolds and fitteds. Thanks for the review. You're welcome! Thank you for your comment and I'm glad to hear you like the covers! Love my Flips! I didn't know they made a night time insert. I'll have to check them out. One thing I noticed in your review, the picture of the cover and insert has the insert with the microfiber side up. You probably just did it for the picture, but it might be best to tell readers NOT to put the mf side next to baby's bum! Thanks for the review. Oh thanks, good point! I totally know that but wasn't thinking straight when taking that photo! I had an upset toddler in the background that threw me off :) Thanks for the comment! These look so smart! I'm due with our first baby in December (yay!!! ), and have been researching cloth diapers. The only thing holding me back is that we travel a lot. These look like the perfect solution. I love that they use organic cotton, too!